Purple Cabbage with Peas Poriyal - A Quick and simple poriyal with purple cabbage and peas. Heat oil in a pan, add the mustard seed when they stop spluterring add the urad dal, followed by curry leaves. Saute for a min. Add the chopped onion, saute it until they turn translucent. Add the chopped purple cabbage with peas along with salt and mix them gently. Sprinkle water , close the pan, keep in low flame (keep stirring occasionally) and allow the cabbage to cook. Finally add coconut and switch off the flame. 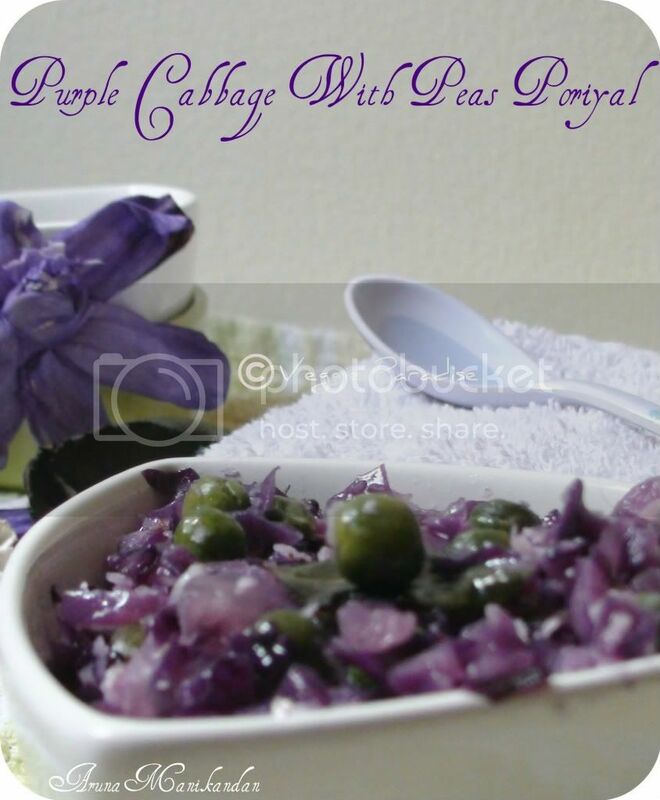 Delicious Purple cabbage with Peas Poriyal is ready to be served. I havn't tried purple cabbage yet but this really looks inviting and delicious..love to try this sometime..thanks for sharing! this is so inviting n yumm..
Love the vibrant colour of purple cabbage looks yummy! never tried purple colour cabbage....my daugher like purple colour very much...will try it!healthy poriyal! Healthy one .. my son loves purple cabbage too. so healthy and I love purple color !! will try this sometime !! The whole set up is so pretty,i love purple cabbage over the white one ...Nice recipe ! Simple and earthy.. love the clicks.. Simple yet yummy one. Loving the color. So healthy and delicious porial. Looks truly inviting...superb presentation !!! Such beautiful and colorful recipe! Love it! Pleasing presentation n a nice recipe to indulge in purple cabbage. Lovely Poriyal never tried this and love the colour of it. Super colourful and delicious poriyal.. Tempting and delicious cabbage fry. 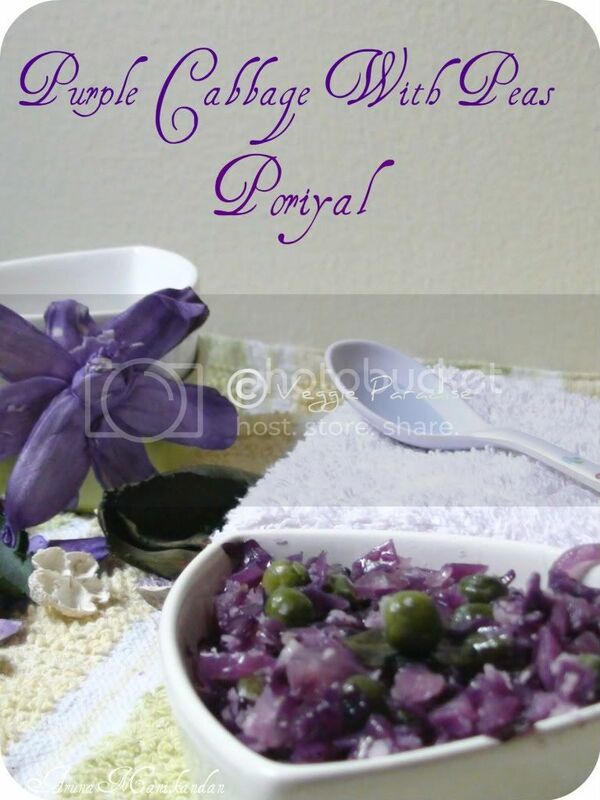 Never tried poriyal with purple cabbage Aruna. Looks simply great!